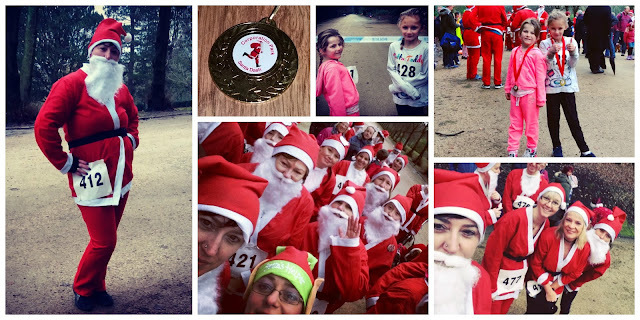 For this weekend's trot out I had registered to join the Blackburn 5k Santa Dash at Corporation Park. Round the corner from home, a free Santa suit and an under-12's 400m dash so my granddaughters could come and join in too. A perfect start to our family Christmas celebrations. The girls loved their 400 meter dash with the eldest winning the whole race and the other just happy doing her own thing and run in her own time and style! Afterwards, we were going to collect their medals and Amie said, "Nana, I won that even though I'm a girl..." so we had a little chat about positive language and the 'This Girl Can' ethos and she's now saying she won because she's a girl. One proud Nana right here. "Nana, run on your tiptoes. It makes you go faster"
and wanted to know that if she did the same running as me, would she one day get a GroupRun t-shirt like me (lump-in-throat moment). It would be great for this Santa Dash to become an annual event. A few tweaks are needed to the organisation but for a first time event, it was well attended and great fun.